Ask the bartender for human and doggie refreshments while dining on the patio at Landmark Bar and Kitchen in Fort Worth’s West 7th area. 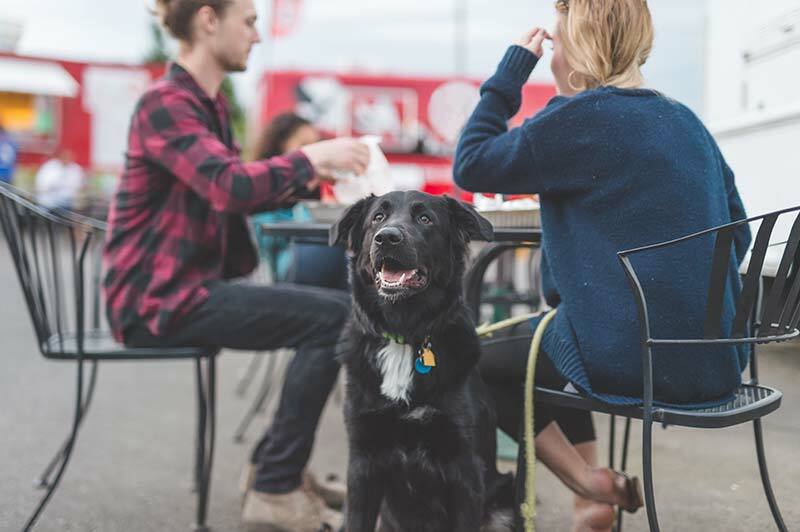 Comfort food, live music, and a very pet friendly staff await you at Shaw’s Patio Bar and Grill on Magnolia Ave. Nothing says “Texas” like Riscky’s, a dog friendly barbeque joint located in the Stockyards. Enjoy a spacious, dog friendly patio, delicious small plates and sandwiches, and a view of the historic Land Title Building in Sundance Square at Bird Cafe in downtown Fort Worth. Cedar Ridge Nature Preserve – Dogs are allowed on the hiking trails in this beautiful nature preserve. Wagging Tail Dog Park – Enjoy 7 acres of off-leash fun in this north Dallas dog park. Prairie Dog Park – This hidden gem contains an off-leash area, playground, basketball courts, and more. ZBonz Dog Park – With a huge, fully irrigated dog park with a pond and agility area, this spot offers fun and freedom for all. Cattle ranching is a huge part of Texas history. Explore the industry with your dog at the Fort Worth Stockyards Historic District. Take a trip back through time with your pet and discover what life was like 100 years ago when you visit the Dallas Heritage Village. You and your leashed, well-mannered dog can take in a movie or concert together at the Coyote Drive-In theater. Enjoy a tasty sip (or three!) and walk the trails with your pup at the gorgeous Lost Oak Winery in Burleson. Not all dogs are ready for a day on the town. Social, well-trained dogs make good adventure buddies. Anxious, shy, or aggressive dogs do best at home. Always prioritize your pet’s health and safety. Make sure they always have plenty of drinking water and shade, and remain alert to signs they’re feeling anxious or overwhelmed. Please don’t hesitate to contact the team at Harris Parkway Animal Hospital with any questions or concerns!